What do you suppose Nathanael was doing under that fig tree to elicit such praise from the Son of God? 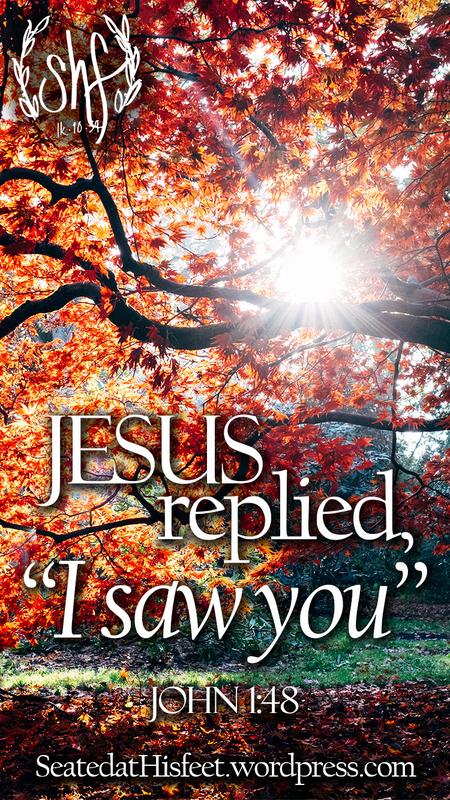 What was it about his actions, attitude or demeanor that caught Jesus’ eye? Was he was just resting in the shade or snacking on some figs? Maybe he was reading or having a conversation with someone. Could he have been praying or meditating on the Scriptures? After all, he was friends with Philip who said of Jesus, “We have found the one of whom Moses in the law, and also the prophets, wrote” (John 1:45). Jesus’ greeting to Nathanael got me thinking. If I were brought face to face with the Savior, what would I hope He would say of me? Would He see anything in my actions and attitudes that was worthy of praise? Now, I know I don’t measure up every day, much less every moment that He sees me. I don’t know any Christian that does. As the Apostle Paul testified, we all “fall short of the glory of God” (Romans 3:23, NIV). But how much more often might I near the mark if I kept that fig tree in mind? When another driver cuts me off in traffic, what would I want Jesus to hear me say? When my child throws a tantrum at the grocery, how would I want Jesus to watch me react? When my boss gives me another unreasonable deadline, how would I want Jesus to see me respond? Sure, I could lash out and then ask God for forgiveness afterward, and He would forgive me every single time. But, what if I caught myself in that moment before I made a wrong call. What if I allowed the Holy Spirit inside of me to check my response? Always remember that nothing you do can save you. Only faith in Jesus Christ can do that. And, no matter what you do, no matter how you act, no matter what your worst reaction looks like, nothing can make God love you any more, or any less, than He does right now—as He always has and always will. But, if we are to be salt and light. If we are to be the hands and feet of Jesus. If we are to be His witnesses to the ends of the earth, we should represent well the One we follow. I thank You that you see us. You see our troubles and our triumphs, our weaknesses, worries and doubts. You see when we make the right choices and when we choose the wrong path, and You’re always there to forgive and guide us back into Your way. Father, I ask that You would guide us by Your Holy Spirit to make choices that would please You. Help us to respond to difficult circumstances in a way that will bring glory to Your name. Grant us the grace to be salt and light to a world filled with hurting people who need Jesus. Let us be the light that points them to Him.